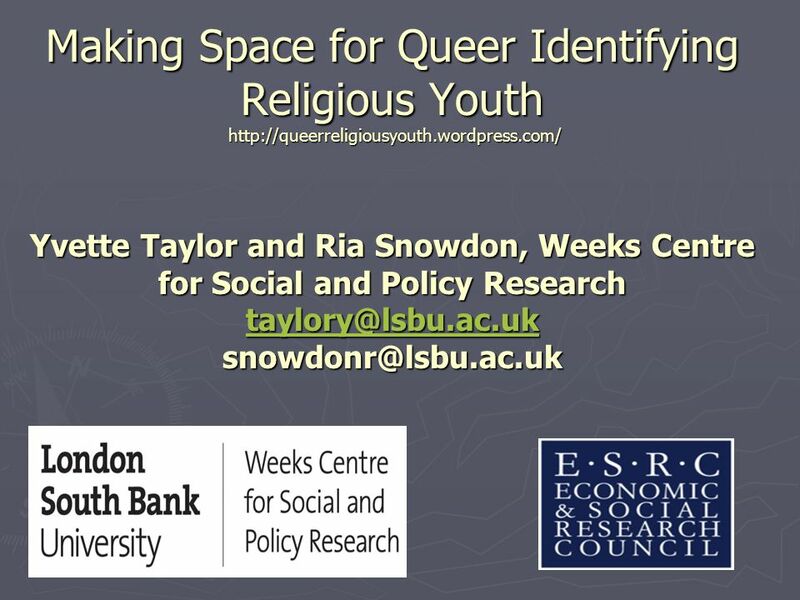 Making Space for Queer Identifying Religious Youth Yvette Taylor and Ria Snowdon, Weeks Centre for Social and. 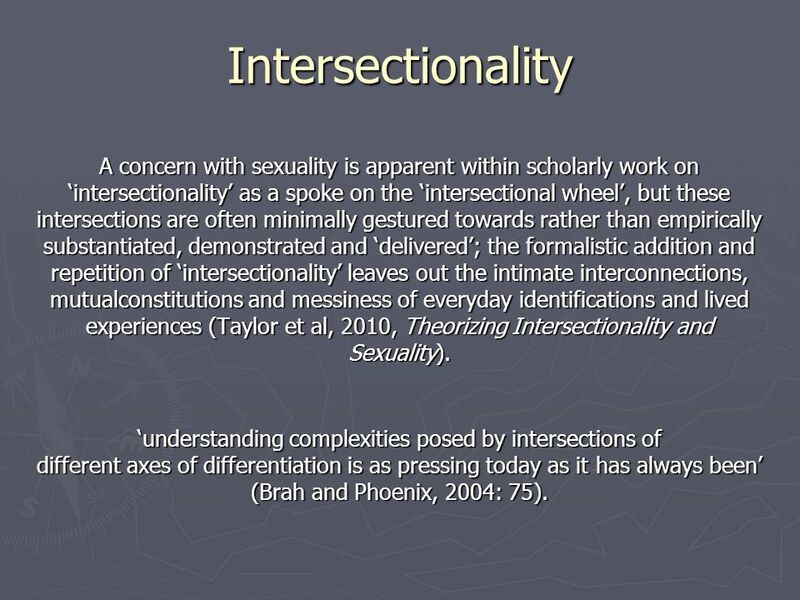 3 Intersectionality A concern with sexuality is apparent within scholarly work on intersectionality as a spoke on the intersectional wheel, but these intersections are often minimally gestured towards rather than empirically substantiated, demonstrated and delivered; the formalistic addition and repetition of intersectionality leaves out the intimate interconnections, mutualconstitutions and messiness of everyday identifications and lived experiences (Taylor et al, 2010, Theorizing Intersectionality and Sexuality). understanding complexities posed by intersections of different axes of differentiation is as pressing today as it has always been (Brah and Phoenix, 2004: 75). 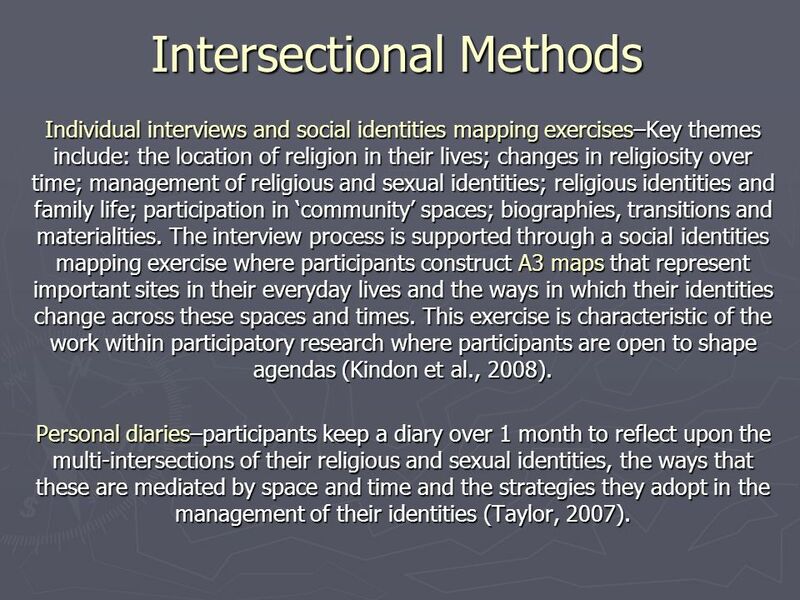 4 Intersectional Methods Individual interviews and social identities mapping exercises–Key themes include: the location of religion in their lives; changes in religiosity over time; management of religious and sexual identities; religious identities and family life; participation in community spaces; biographies, transitions and materialities. 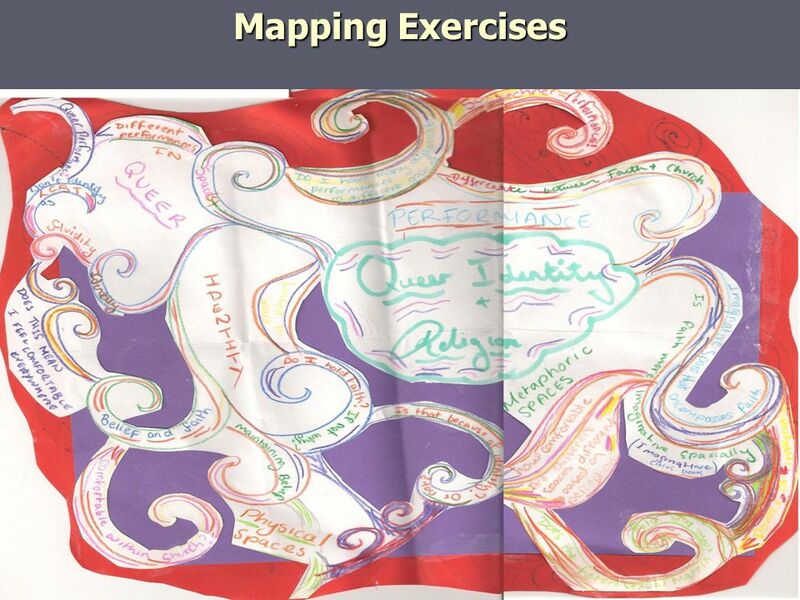 The interview process is supported through a social identities mapping exercise where participants construct A3 maps that represent important sites in their everyday lives and the ways in which their identities change across these spaces and times. 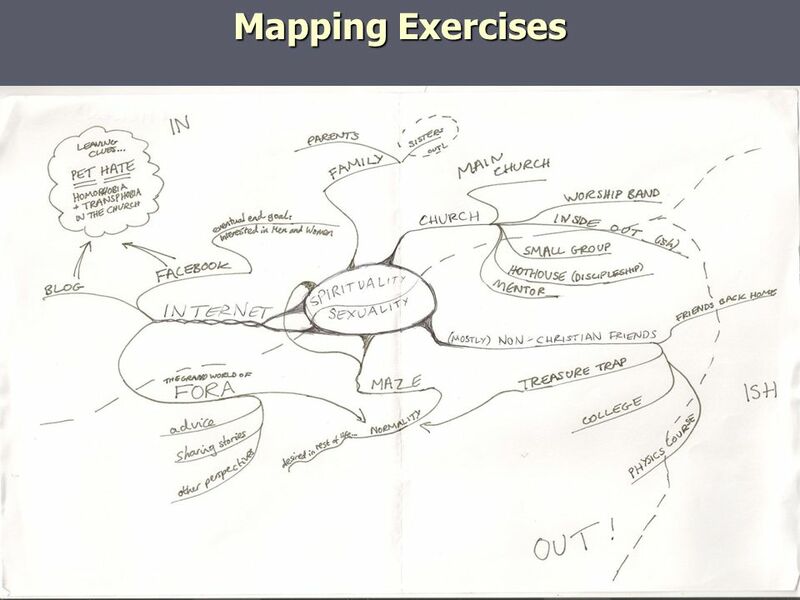 This exercise is characteristic of the work within participatory research where participants are open to shape agendas (Kindon et al., 2008). 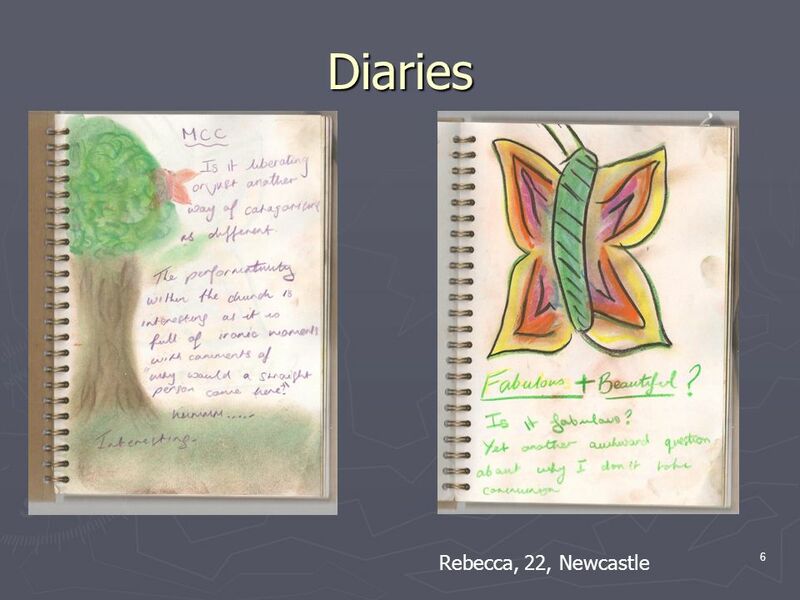 Personal diaries–participants keep a diary over 1 month to reflect upon the multi-intersections of their religious and sexual identities, the ways that these are mediated by space and time and the strategies they adopt in the management of their identities (Taylor, 2007). 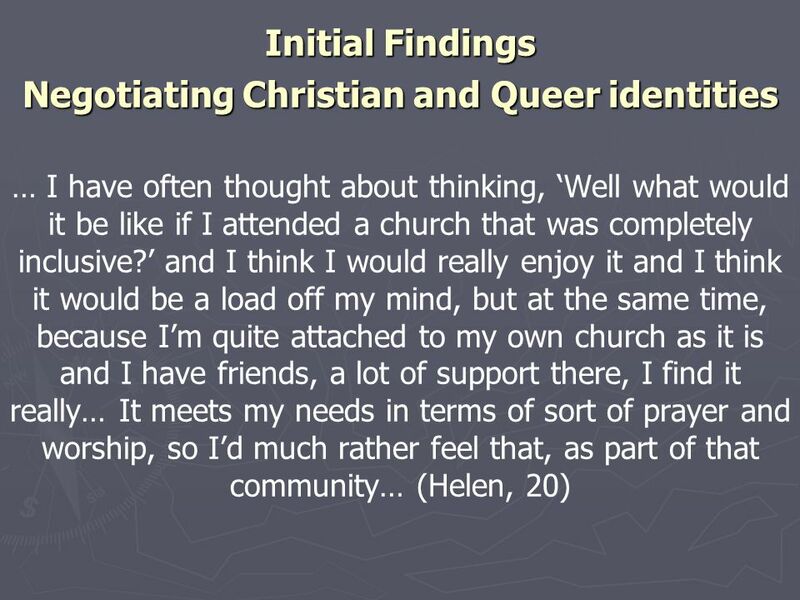 13 Initial Findings Negotiating Christian and Queer identities Probably gay dominates Christian quite a bit but thats just because its easier to be gay than it is to be Christian, on an outwards appearance. 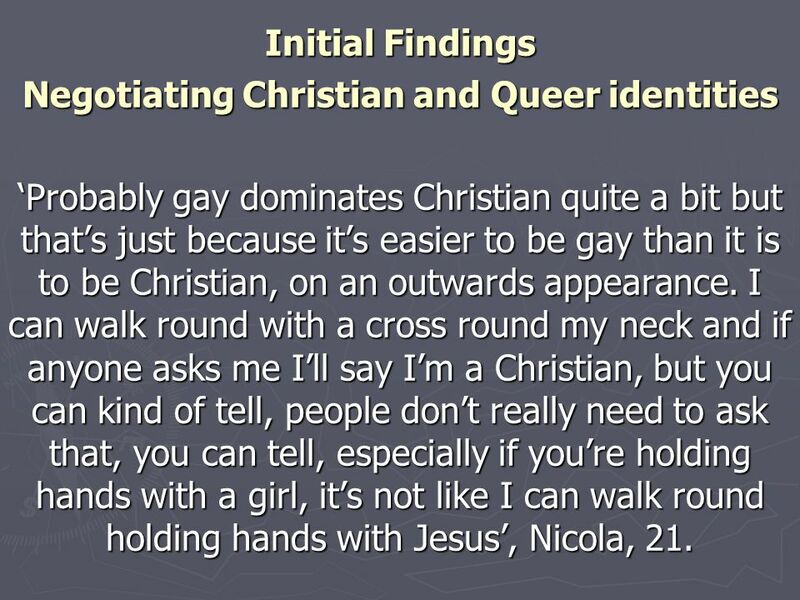 I can walk round with a cross round my neck and if anyone asks me Ill say Im a Christian, but you can kind of tell, people dont really need to ask that, you can tell, especially if youre holding hands with a girl, its not like I can walk round holding hands with Jesus, Nicola, 21. 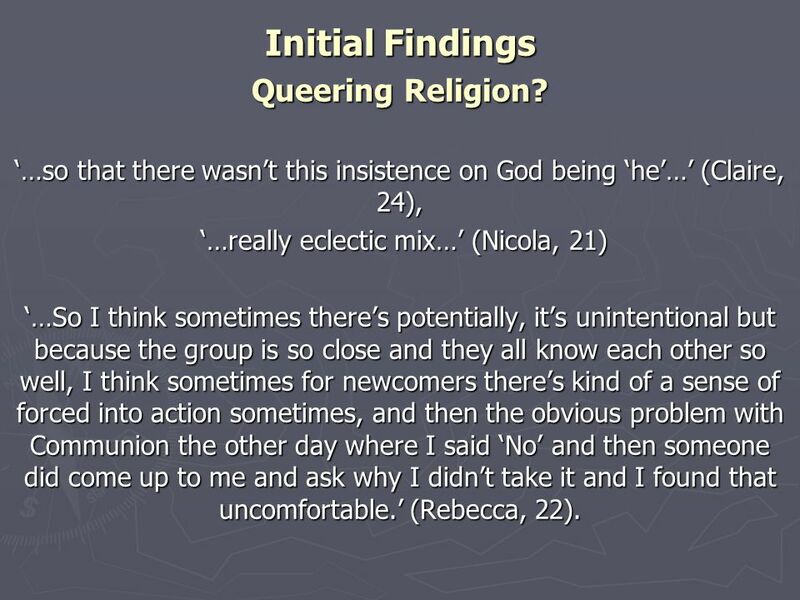 14 Initial Findings Queering Religion? …so that there wasnt this insistence on God being he… (Claire, 24), …really eclectic mix… (Nicola, 21) …really eclectic mix… (Nicola, 21) …So I think sometimes theres potentially, its unintentional but because the group is so close and they all know each other so well, I think sometimes for newcomers theres kind of a sense of forced into action sometimes, and then the obvious problem with Communion the other day where I said No and then someone did come up to me and ask why I didnt take it and I found that uncomfortable. (Rebecca, 22). 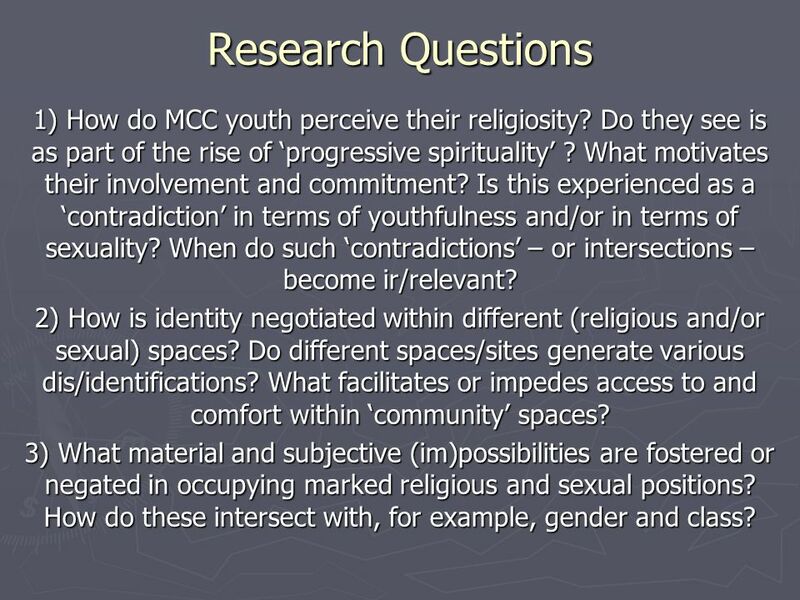 15 Research Questions 1) How do MCC youth perceive their religiosity? Do they see is as part of the rise of progressive spirituality ? What motivates their involvement and commitment? 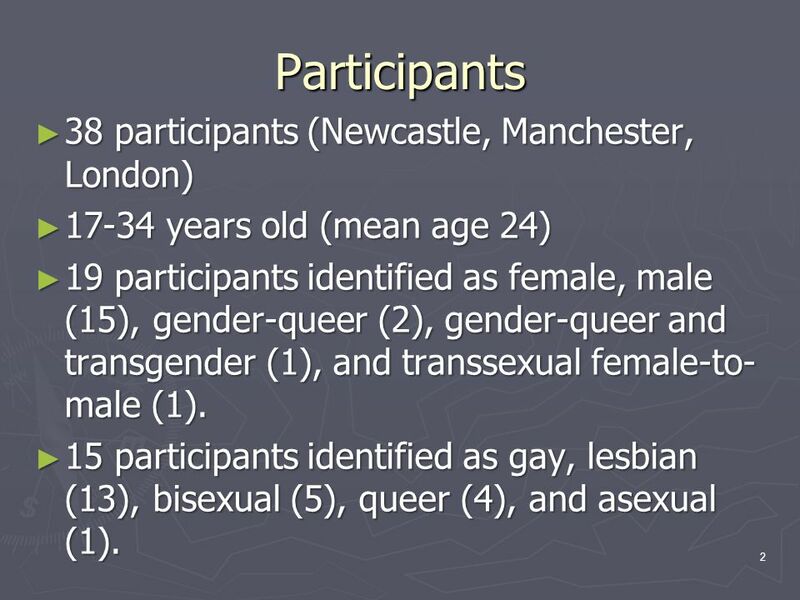 Is this experienced as a contradiction in terms of youthfulness and/or in terms of sexuality? 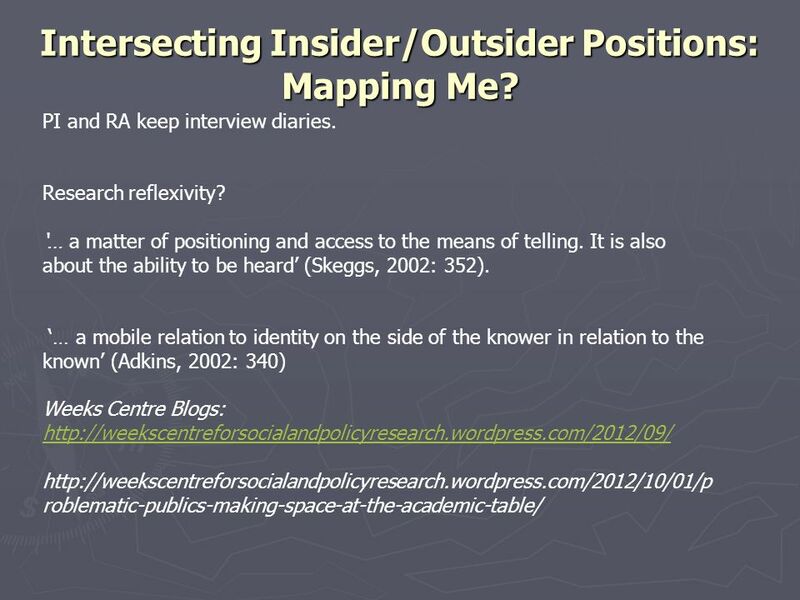 When do such contradictions – or intersections – become ir/relevant? 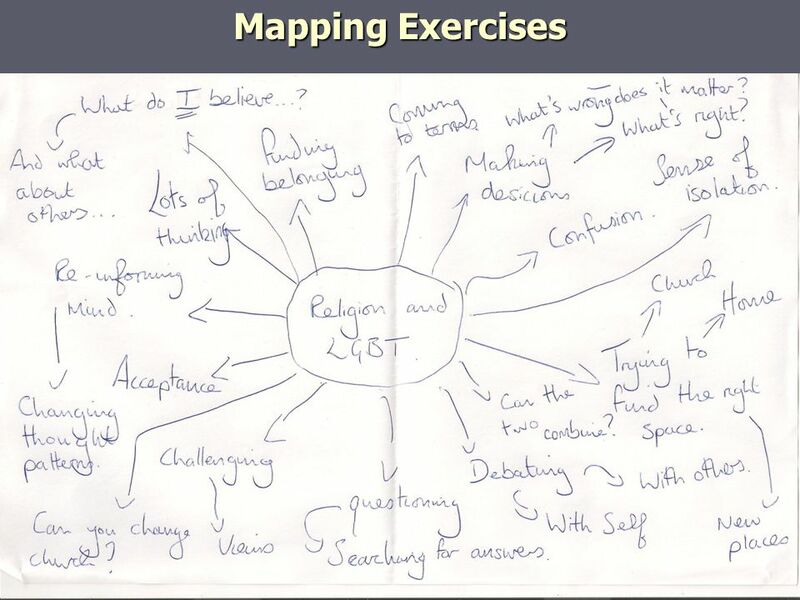 2) How is identity negotiated within different (religious and/or sexual) spaces? Do different spaces/sites generate various dis/identifications? What facilitates or impedes access to and comfort within community spaces? 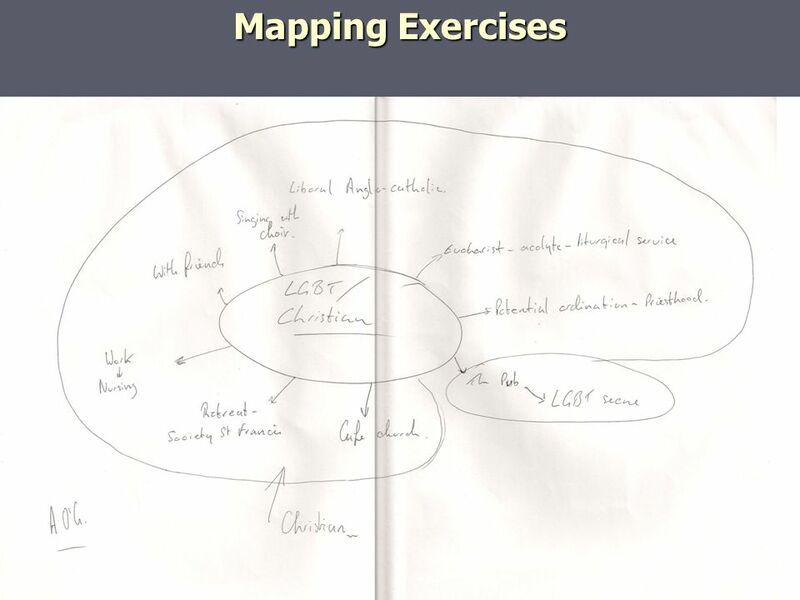 3) What material and subjective (im)possibilities are fostered or negated in occupying marked religious and sexual positions? 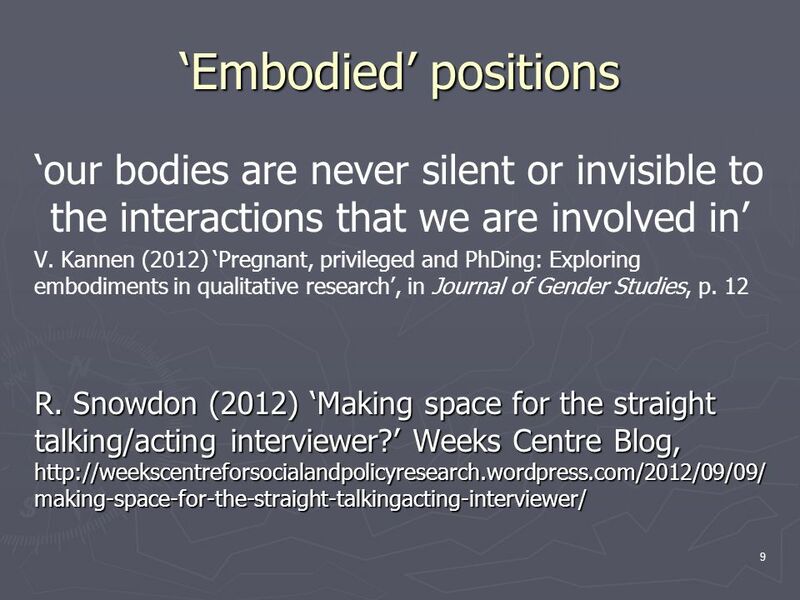 How do these intersect with, for example, gender and class? 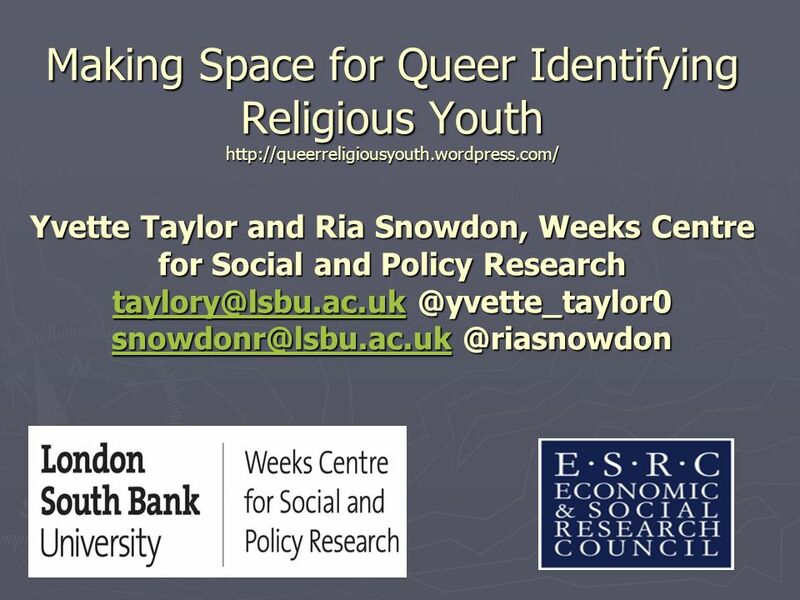 Download ppt "Making Space for Queer Identifying Religious Youth Yvette Taylor and Ria Snowdon, Weeks Centre for Social and." Week 3: Living in 3D. Week 3: Living in 3-D You are the salt of the earth. But if the salt loses its saltiness, how can it be made salty again? It is. Management Tips ©Tom Beasor Talent I was reading a Tom Peters book called Talent and he is very keen to tell people that there. Bullying, Safety and Respect for All Beth Reis, M.S. Health Educator, Public Health – Seattle & King County Co-Chair, Safe Schools Coalition December 2008. Fostering Students Social Capital Improving retention in the era of mass education. Minding the Gap: disparities in degree attainment in HE 22/1/ 2008 IOS Experience of Black Students in HE Disparities in degree Attainment. What youth wish you knew but probably wont tell you with Jon Heinly. 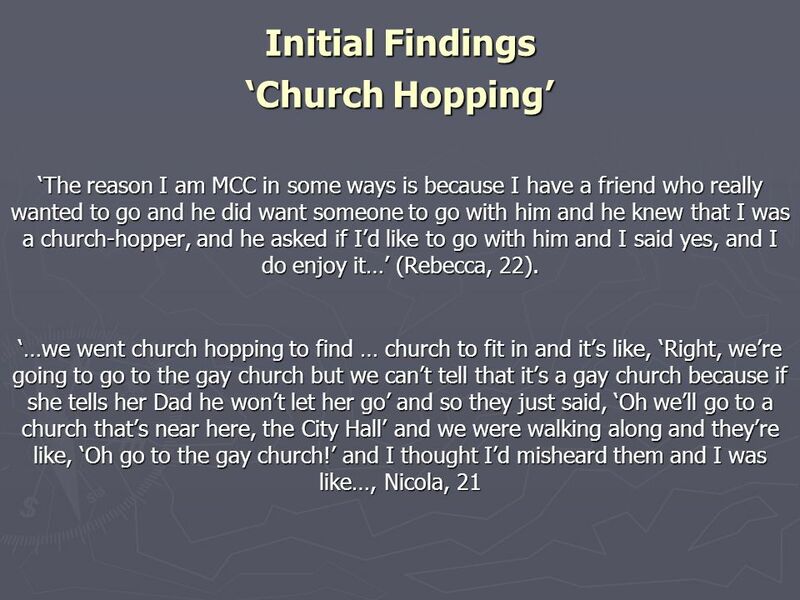 Sexual Identity and Young People In Northern Ireland Providing a safe haven for 16 – 25 year olds who do not identify as heterosexual. 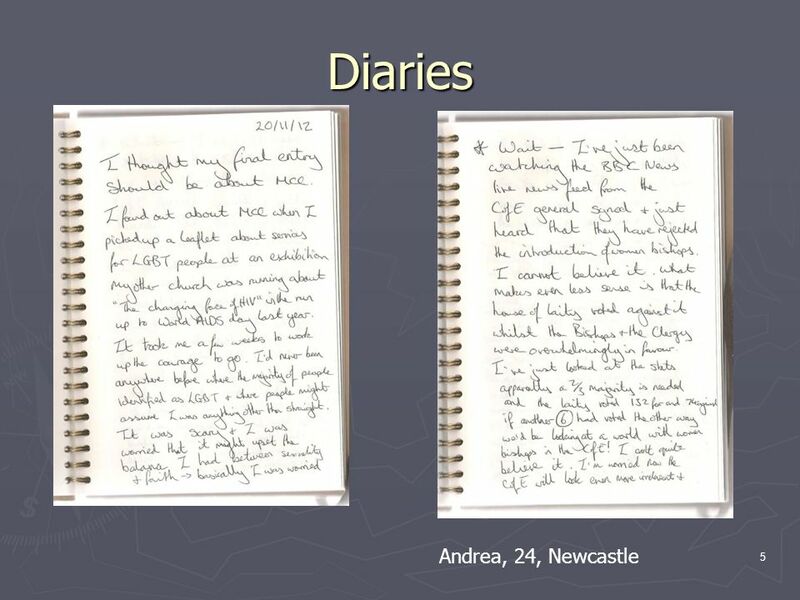 ‘Growing up girl’ and ‘Being boy’ – building and challenging gendered social realities over time through sibling relationships Rosalind Edwards University. STUDENT INTEGRATION: WHAT HELPS AND WHAT HINDERS?.....RETAINING STUDENTS Workshop for Degree Programme Directors. The Inclusive Campus: Exploring the Social Capital of International Students in UK University Campuses Dr Mark Holton School of Geography, Earth and Environmental.